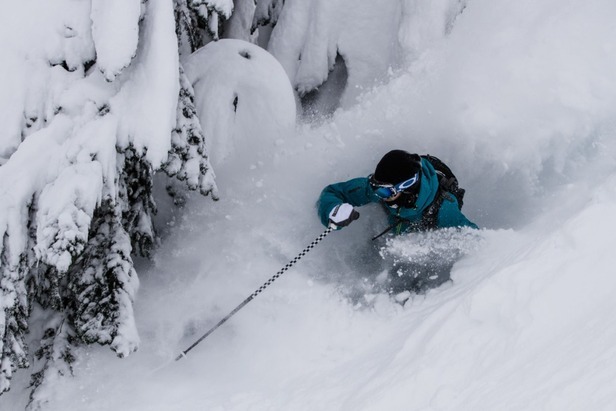 Want to feel like a Stevens Pass local? 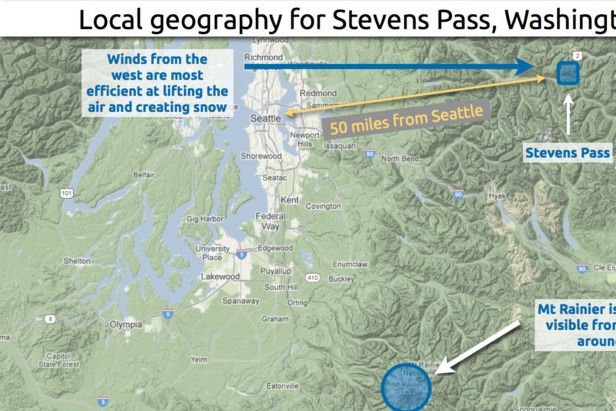 Read this quick overview about Stevens’ geography and weather patterns and you’ll be on your way. Stevens Pass is located on US Highway 2, about 50 miles east of Seattle along the crest of the Cascade mountain range. 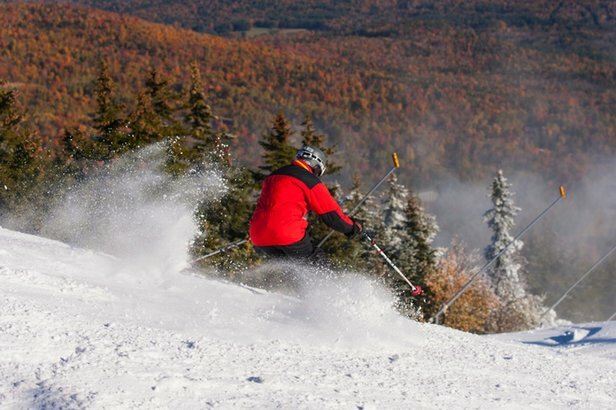 The resort stretches from a base elevation of 4,061 feet to 5,845 feet at the summit. With the Pacific Ocean close by to the west and a drier, colder continental climate to the east, the weather can change quickly. This quote from the Northwest Weather and Avalanche Center sums it up: “We have seen the temperature rise 20 F degrees in just 30 seconds. Have also felt on a dead calm day the wind go from 0 to well over 100 mph in less than a minute. Some times it snows at 36 F degrees and some times it rains at 28 F degrees with the inversions we see at times. We have also watched a snowfall of 30 inches and only been able record 15 inches because the snow settled so fast. We can also see large inversions of sometimes 20 F degrees at the base and 50 F degrees on the top of the Mountain.” Indeed this is a place to find quickly-changing weather, so be prepared for anything. On the plus side, this wacky weather can sometimes lead to exceptionally high snowfalls. To get big snow, three things need to happen. First, a storm must pull in moisture from the Pacific Ocean. Second, this storm must have its origin in an area to the north of the ski area so that it can mix colder air into the equation. And third, a wind from the west gains 4,000 feet of elevation from sea level in a short span, and this rising air helps to efficiently convert the moisture into snow. When all three factors combine, snowfall rates can be astronomical with up to four feet falling in just 24 hours. The reported snow is measured at the top of the Daisy chairlift and provides a representative report of what skiers will find on the hill. Another snow study area used for avalanche forecasting is located at the top of the Skyline chairlift at 5,240 feet. When you ski at Stevens, keep an eye on the snow level and the temperatures. Abundant moisture is rarely a problem for this area of the country with 450 inches of average snowfall each season. To find the lightest powder, look for temperatures in the upper teens to lower 20s. Now that you know the local weather patterns at Stevens Pass and how snow is measured, the only thing left to do is to enjoy your powder day!